Andy has served for more than 30 years as general counsel to municipalities, and is the Leader of Eaton Peabody’s Municipal Law & Finance Practice Group. He provides general counsel advice to various municipalities, including Lincoln, Mount Desert, Howland, Greenville, Oakﬁeld, and Baileyville. 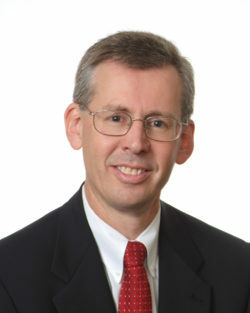 He also has more than 30 years experience in general environmental counseling and regulatory compliance, natural resource permitting, and land use permitting, with extensive experience in hazardous substance and waste laws from which he is the author of the Maine law treatise on Brownﬁelds Redevelopment published by Matthew Bender. In addition, Andy maintains an extensive utilities practice, which includes serving as general counsel to a number of public water utility districts. Andy is a resident of Bangor and is the past chair of the Katahdin Area Council Boy Scouts of America, Bangor YMCA, and Bangor Chamber of Commerce. In addition to other community organizations, Andy is currently providing community services in conjunction with Eastern Maine Development Corporation’s Mobilize Maine Re-Engineering the Region economic development planning efforts.